Wemmick’s place has a drawbridge (over a small ditch) which can be raised and lowered. There is also a tall flag pole and a turret. Sounds fantastic! Wemmick is very proud of his majestic, albeit tiny home. He keeps a pig, fowl, rabbits and a small garden out back. If he’s ever attacked, he can hold his own! He leads Pip down a twisted path to a small ornamental lake where their punch is cooling. In the middle of the lake is a small island which appears to contain their salad. Oh, and there’s a fountain. (Wow, I want to live here!) Pip compliments Wemmick on his engineering, carpentry, plumbing and gardening skills. “I’m a Jack of all Trades, ” says Wemmick. They head into the “castle” to meet the Aged. Wemmick’s mother or father? I hope everyone here in the States is enjoying a nice Labor Day! 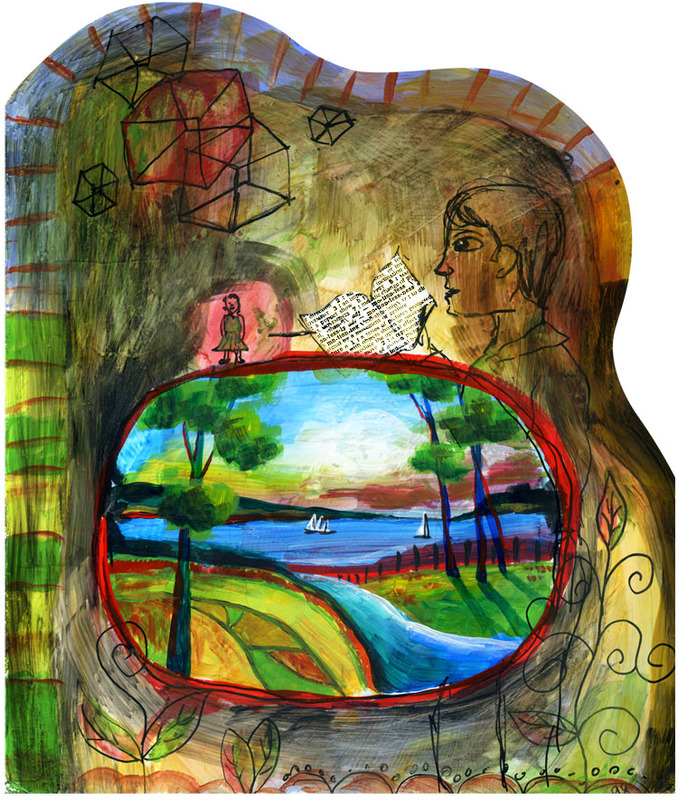 I created this painting on an old board book panel. (That’s why it has a strange shape!) I first gessoed the panel (it’s left over from a workshop), and then started by painting the marsh scene in the middle. Little Biddy stands on top as Pip reads to her. He thinks he is smarter than her (all his studying has gone to his head… well, you know what I mean). This may be partly because she is a girl and girls often at that time in history didn’t receive an education. Or it could be that he has to study so hard and he never sees her studying. 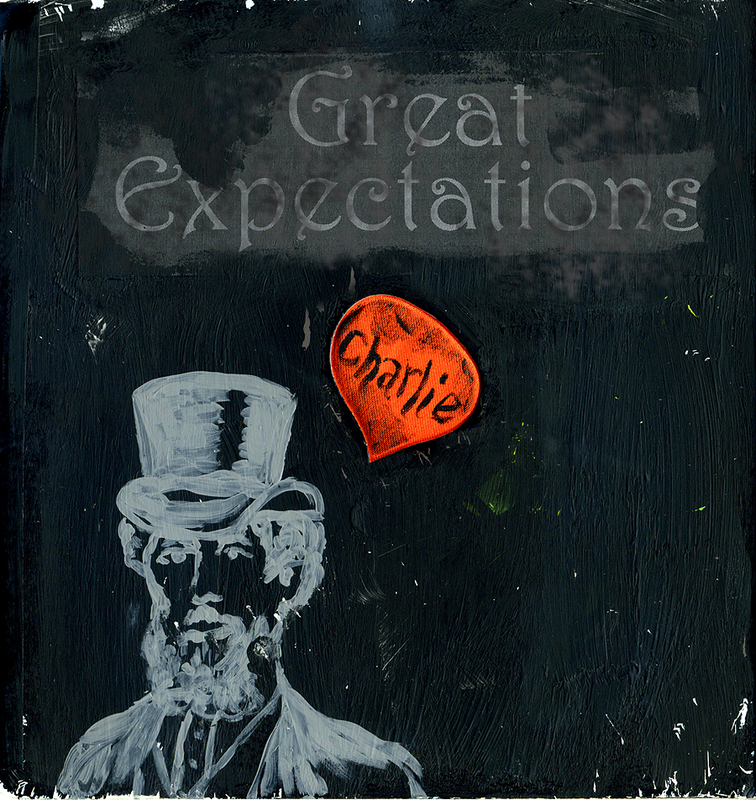 I’m getting close to 100 days, 100 pages and 100 pieces of Great Expectations art! 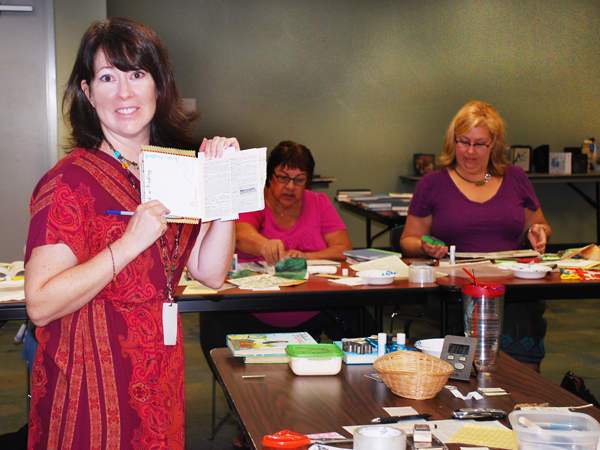 My Altered Book Workshop was on September 22 and was a success (exito)! 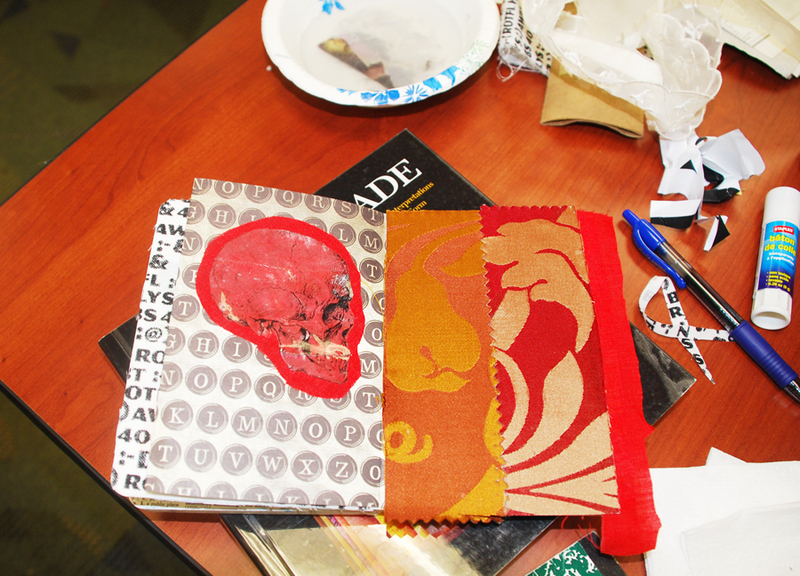 This workshop was a brief (2.5 hours), hands-on intro into the world of Altered Books, covering many techniques. 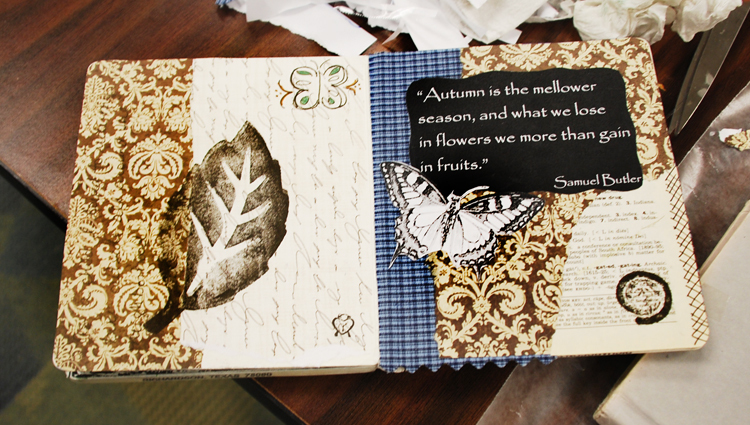 Hopefully particiants took the new skills they obtained home and continued creating on their altered book projects. It’s a great library! Maybe the one in your town is too. If you don’t know, go check it out! Now… or tomorrow… but soon. Look at all these materials! 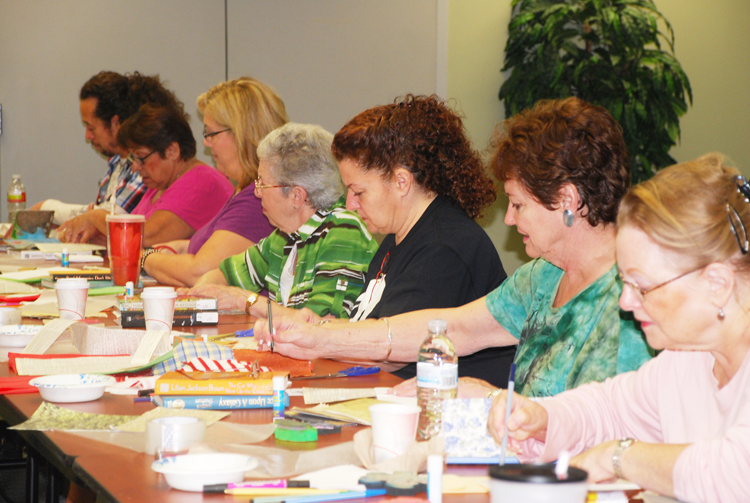 Each participant received 2 chapter books and 1 board book to alter. 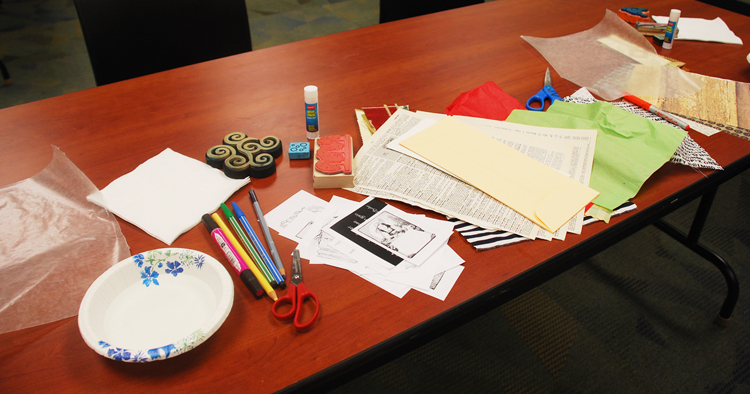 Then on each workstation the following items were placed for their use during the workshop: stamps and ink pads, glue sticks, scissors, bowl of water for transfers, packing tape to share, drawing utensils (colored pencils, markers, pens, pencils), old dictionary pages, other paper ephemera (collage papers), various envelopes, fabric, wax paper and paper napkins – to dab up any little messes! On another table in the back: plenty more paper pieces to choose from (some cool old maps), more drawing utensils including pastels, embellishments (ribbons, buttons, sequins) and stronger glues. It seemed like everyone had a good time and hopefully learned a few things. Plus got their creativity stirred up a bit! I’m on Day 86. 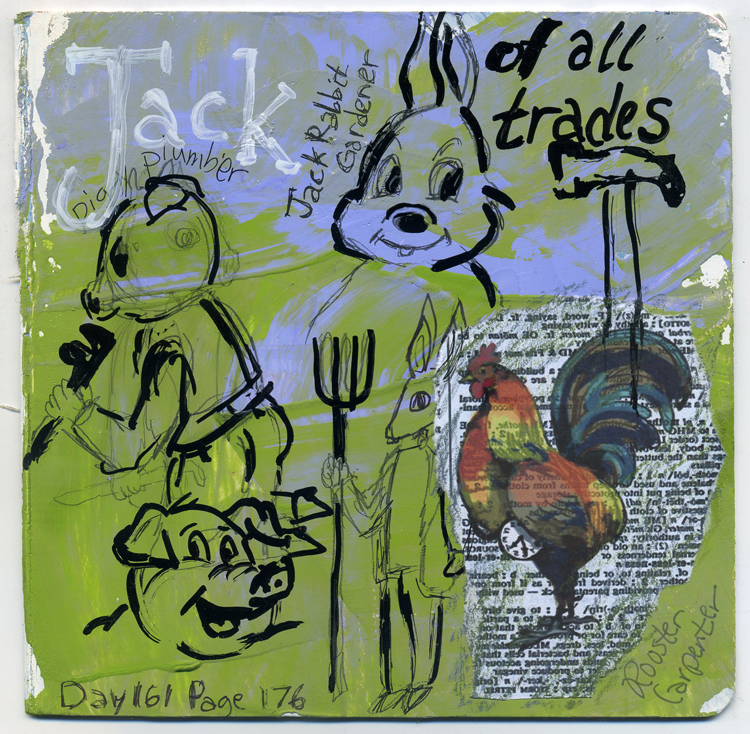 I had originally planned to read a page a day of Great Expectations by Dickens and create a piece of art a day that somehow relates to what I read. This project has been more of a commitment than I had originally planned. Well, I just didn’t think it all the way through. The book is 412 pages after all! My original goals were to read the whole book along with my son, carving out a little time each day to be creative, learning some new techniques and trying a few new styles of art and illustration. Even though I am not working on this every day, I feel I am accomplishing those goals. Can’t wait until I finish the book so that I can watch every Great Expectations movie ever made! We are introduced to Orlick, Joe’s journeyman. I wasn’t sure what a journeyman was so I looked it up. 1. a person who has served an apprenticeship at a trade or handicraft and is certified to work at it assisting or under another person. 2. any experienced, competent but routine worker or performer. 3. a person hired to do work for another, usually for a day at a time. Orlick and Pip do not like each other. 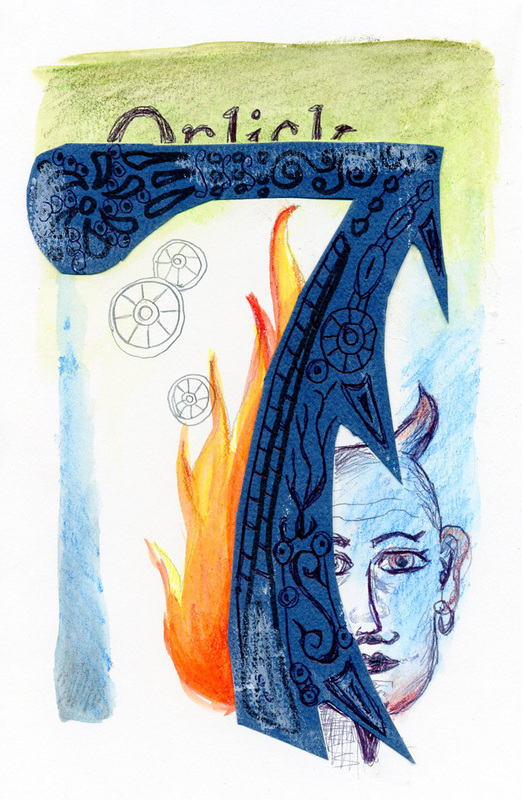 When Pip was young, Orlick told him that the Devil lived in a dark corner of the forge. How scary is that?!? Orlick also told Pip that every seven years they have to start the fire in the blacksmith shop with a live boy! Poor PIP! He probably lived in fear of when the next 7th year would be. Orlick is no friendlier with Pip now that Pip is an official apprentice. In fact, Orlick still beats his sparks in Pip’s direction. Pip feels many emotions – humiliated, hurt, spurned, offended, angry and sorry. He starts to cry, but when Estella notices and smiles, he forces himself to stop. That is, until she leaves him alone. Then he wails, pulling his hair and kicking a wall behind a fence gate. He thinks of how his sister raised him, by hand, cruelly, never showing any love. And Pip, never knowing the love of a mother. 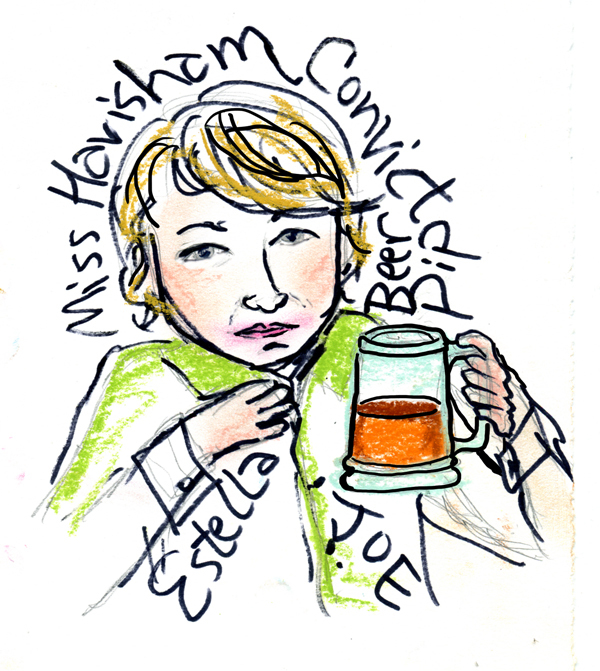 He gains control of himself and starts to look about the deserted brewery next door to Miss Havisham’s house. 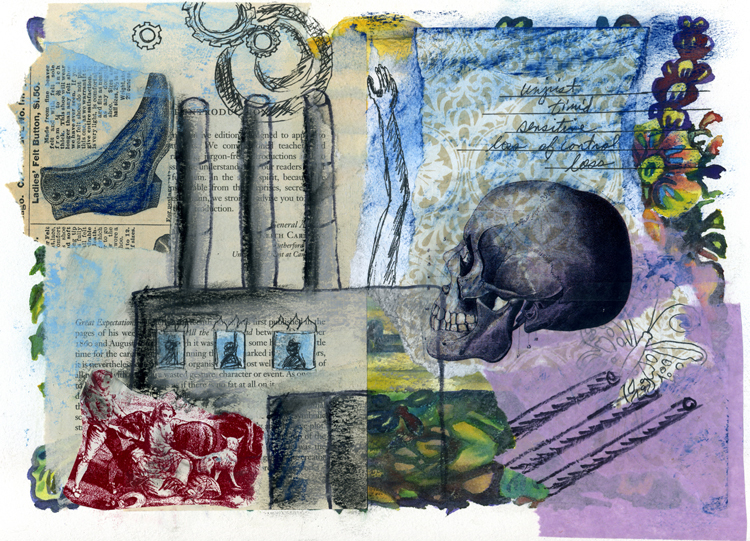 Here is a collage I created yesterday on top of an old watercolor painting I did many years ago. I had grown tired of it and it needed a new life. It was of a bee hive with some pretty flowers growing around it. 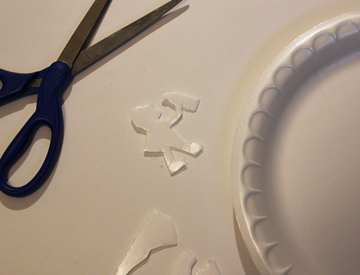 There are pieces of it peeking through the paper I glued on top to give myself a new working ground. I was thinking of canons firing, the new birth of factories popping up in England at this time, Pip’s sister and his loneliness. I think things are about to seriously change for Pip… for better or for worse! Estella beats Pip at cards. (She’s so mean!) Miss Havisham asks Pip to come back in 6 days to “play” some more. She sends the two children away with instructions for Estella to give Pip a meal. Estella takes Pip back outside and leaves him in the courtyard by the side door. She comes back with meat, bread and beer for him. 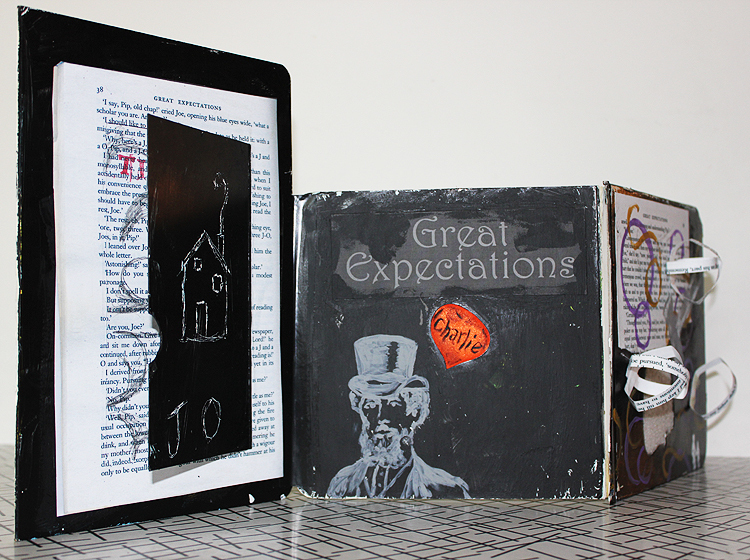 This is my altered book triptych based on pages of Great Expectations that I have read over the past few days. I’ve been reading a page a day for about 39-40 days now and creating art to go along with what I read. 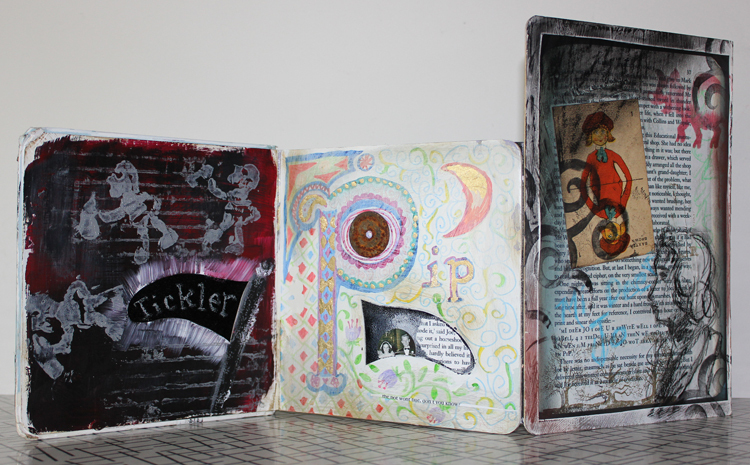 I used several children’s discarded board books to create this project. Look at my previous posts to see the progress! 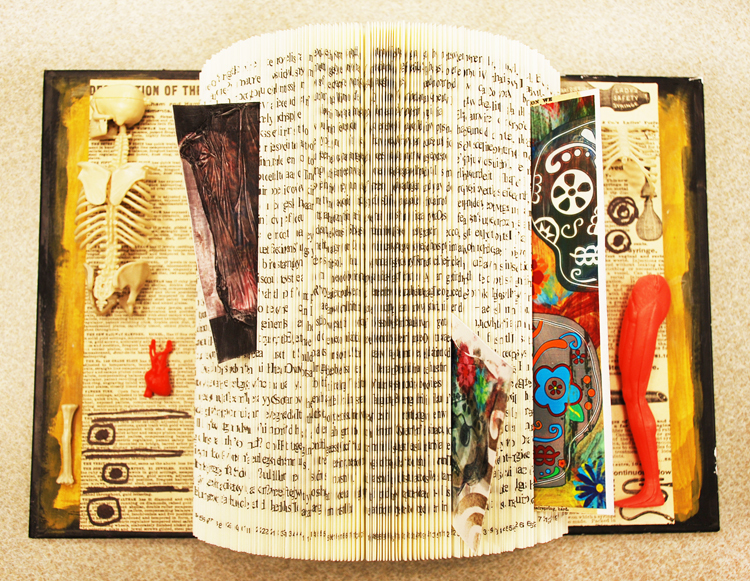 Day 39: the 6th (and last) panel of my altered book triptych. I will take some photos tomorrow of the whole thing, both sides, to post. It all looks good together! Mrs Joe has been out all day at market with the bumbling Mr Pumblechook helping him select household goods. (He’s incapable of doing this himself?) Joe has been cleaning and telling Pip his life story, mainly his childhood. They hear her coming up the road on Mr P’s chaise-cart. It’s very cold. (Remember, it’s winter, a year after the incident with the convict.) Once inside, warming by the fire, Mrs Joe remarks that Pip had better be grateful for something being offered by a woman. (Exact word used was “she”.) “SHE?? ?” Pip and Joe remark. Who is this mystery woman and what is she offering Pip? On this panel, I freehand painted a little portrait of Dickens and added the title of the book. There was this odd shaped red satin bloop in the middle so I turned that into a speech bubble. 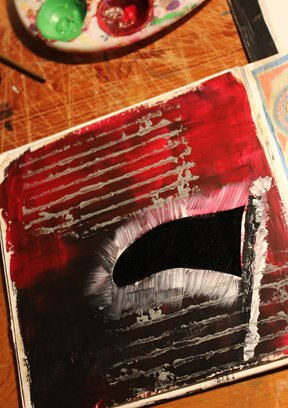 For the next few days (maybe a week) I plan to work on one larger piece, spending more time on it. I’ll post my progress daily though! 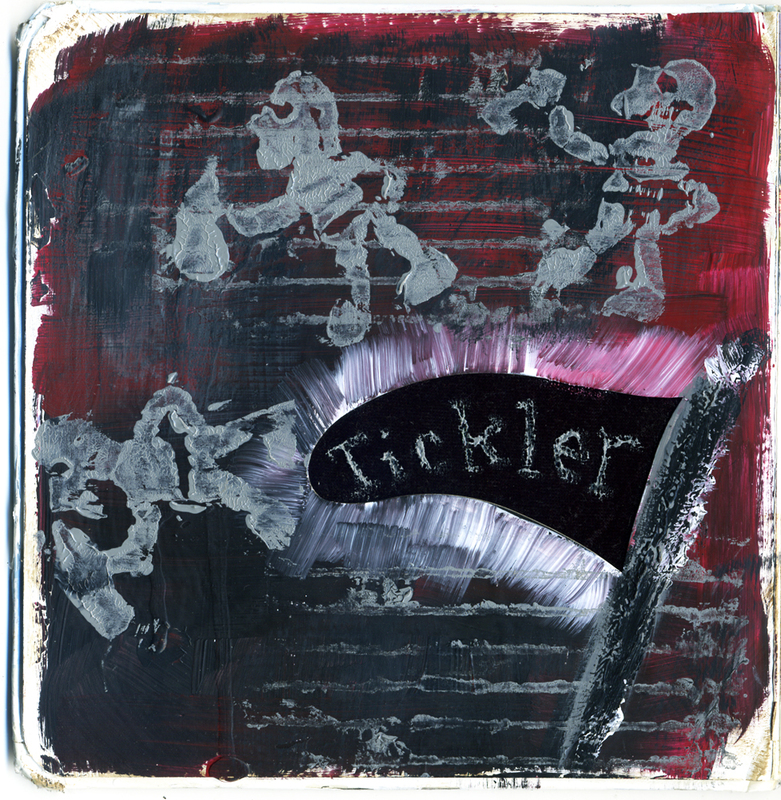 Again… here is the slightly pornographic black shape with “Tickler” written across it! Yikes! This really is very innocent… a penguin’s fin and Tickler is the knobby cane Mrs Joe uses to keep Joe and Pip in-line. This is what Dickens chose to call it! 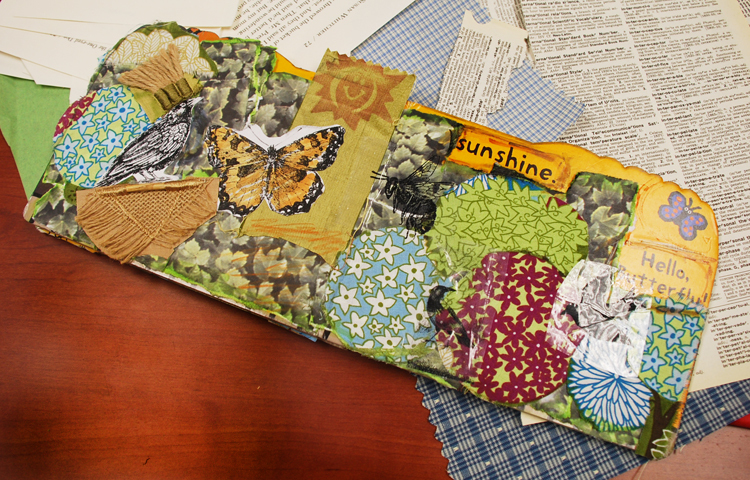 Here is panel 5 of the Altered Book I am creating as I read along in my copy of Great Expectations. In this part of the story, Joe tells Pip that Mrs Joe is given to government… the government of Joe and Pip! She won’t like it if Joe becomes a scholar because he might rebel against her and her governing. Joe puts up with her because he sees his poor mother in her and all her suffering and slaving away. Pip develops a new respect and admiration for Joe. For this panel, I decided to play with printing. 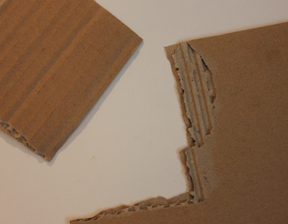 I tore apart some cardboard and painted the inside with gray paint. Then used it like a stamp to print. Just wanted some interesting texture. 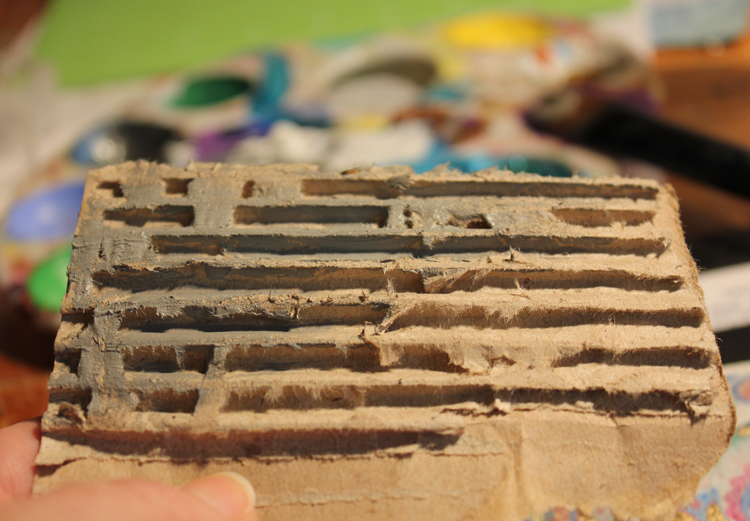 Next I made a stamp with that awful environment-hating styrofoam. It works great for carving and printing. I made a little Pip holding a bottle of tar-water. (Another method of Mrs Joe’s to keep the boys in-line!) I painted this stamp with the same gray acrylic paint and made three prints with it. Pip walking around the Tickler.